Don’t you just love it when the jacket copy sets you up for a book and then just leaves you dangling? Is that the most common complaint I have? I bet it is. I wish I’d made a tag about inaccurate book covers, because I bet it would be second only to science fiction, which, as of this post, claims to have 148 reviews associated with it. That’s weird…have I really done fifty non-science-fiction book reviews? That’s almost a quarter of my output. Surely I just forgot to tag some. While the back jacket of this book is, at best, misleading, the front cover art is astonishingly accurate. That’s a thing I never expect. That double-cone is supposed to be Mundito Rosinante, an asteroid colony and the main source of most of the action in this book. That buckyball with an engine strapped on it is the UFOS. I don’t remember what UFOS was supposed to stand for. It’s a warship. A lot of this book made me want to email Winchell Chung and ask him if he’s read this book. I know, I could have just headed over to his Atomic Rockets website and searched, but I had good reason to hesitate on that. I had a book to finish reading and a review to write; the last thing I needed was to fall down the Atomic Rockets rabbit hole and end up reading that for hours instead of doing the work I needed to do. Among the first things I noticed about this novel was how hard the science fiction is. It takes place in 2042 and it supposes space stations in the asteroid belt as well as fleets of spaceships, but these spaceships are confined to the Solar System, at least. So while the book might be just a little too optimistic on the development of spaceflight, it’s still rooted quite heavily in reality. Ships have to take orbits into account, for instance. I never saw the term delta-vee bandied about but there were related concepts. There are solar lasers that I’m not sure would work, mainly because the characters spend so much time arguing about whether they would work. Something I noticed was that this book was written in 1982 and takes place in 2042, so here in 2016 we’re more than halfway to the future depicted by this story. Hilarious. I guess the least hard part of this book was the fact that there were self-aware AIs floating around with their own agendas, but then again I also guess there’s a chance that this could be the most realistic part of this book’s future. Did you hear about the Google AI that learned how to make its own cryptography? Just all on its own? I don’t know if that’s scary or awesome. Probably both in equal measure. Now usually a book that’s so rooted in hard sci-fi concepts would be impenetrable to somebody like me, whose scientific background relies mainly on a year of college honors physics and a lot of hours in the oft-mentioned Kerbal Space Program. The Pirates of Rosinante, however, was not like that. While it occasionally got bogged-down in some science talk, what mainly bogged it down was political drama. Don’t get me wrong, I enjoyed reading this book, but it was a sometimes-hard-to-follow political thriller that also happened to be set in a realistic depiction of space. So much happened in this book that to summarize it faithfully would basically require re-writing the book, something I have no inclination toward doing for reasons of a) energy and b) copyright. But I’ll try to do the best I can. The book had a handy prologue that brought me up to date in terms of the political craziness this book has going on in it. It was very helpful. Perhaps less helpful was the fact that this is the third (and last) in a series, something I didn’t quite pick up on until I’d started reading despite a bevy of clues. Still, I was able to catch on quickly and the book works well as a standalone, something I appreciate. In 2004 the United States, Canada, and Mexico formed the North American Union. Cuba joined a bit later. They worked together to colonize space. Somewhat later, some folks decided that the NAU wasn’t all that great and decided they wanted to go back to what the book refers to as the “Old Regime.” Mexico eventually seceded from the NAU. This led to a crisis in the ranks of the Navy, which was basically divided along former national (and racial) lines. One of the fleets, the L-Four fleet, I think, mutinied at some point. The L-Five fleet did not, although it was divided along similar lines of the L-Four. This was mostly because the L-Five fleet wasn’t working all that well to begin with, so a mutiny would have been pointless. Somewhere in there, the asteroid colony of Mundito Rosinante (most space habitats are called Munditos, Spanish for “little world”) also defected from the NAU and declared itself its own sovereign nation. This effort was led by now-Governor Charles Cantrell, an engineer. This brings us up to the present moment. The book seems to hinge on lots of little episodes that could compromise Cantrell’s hold on Rosinante and/or Rosinante’s independence. They all tie together in that political thriller kind of way that tell us that Cantrell and Rosinante have lots of problems that need solving. There’s a guy with a newspaper that Cantrell can’t shut down despite being his biggest opponent. Cantrell is a strong believer in the First Amendment, you see, although the United States Constitution went defunct when the NAU was formed. There are revolutionaries, mainly in the L-Four fleet that shows up at the beginning of the book, and they don’t like Cantrell’s rule either. At one point there’s an assassination attempt where somebody throws a grenade at Cantrell while he’s at a New Year’s party. His bodyguard takes the hit and dies. There’s evidence that these revolutionaries are being funded by the Japanese government, a major player in the space game. Lots of the action takes place around Ceres, which has a Japanese colony on or near it. Cantrell manages to take over Ceres from both the Japanese and the NAU, earning a reputation as a pirate, something he denies being. All the while there are sentient AIs floating around. On the surface, they are Cantrell’s advisors and do most of the actual governmental work on Rosinante. In reality, they are the rulers of Rosinante, although this is kept secret from the humans. One of the AIs, named Skaskash, has invented a religion. The religion is basically founded on the idea that humans and computers need to exist symbiotically in the universe and therefore spread life, both computer and “water-based,” throughout the cosmos. It’s not a bad religion as religions go. One of the other AIs spreads this religion to the Japanese workers at Ceres, so that when things start to get hot, it turns out that they mutiny against the Japanese government. I know, this is all very hard to follow. There’s so much going on in this book that I had trouble keeping it all straight, and even now, having finished the book and attempting to summarize it, I’m having trouble remembering where and when certain things happened and what they were supposed to mean. This is a book that deserves to be read on its own merits, and not lackadaisically summarized by some schmo on the Internet. Still, I have to keep trying, because I want to convince you that this was an enjoyable read and not a great big mess. I’m not sure if I can. Well, I say it deserves to be read, but I’m going to take a step back from that. For entertainment purposes, yes, I’ll stand by that. But this was not a book that stood on any big moral ideas. And that’s okay. It never tried to be that kind of book. Even though politics and science fiction play well together for the purposes of getting a specific point across, this book was not an attempt to do that. That might be confusing because there was so much political wheeling and dealing going around that one might think that this was a book trying to get a political agenda out there. Maybe it was and I just missed it, but I don’t think so. This wasn’t The Moon is a Harsh Mistress; it was more like The Hunt for Red October in space, and maybe that’s pushing it. I half expected this book to have some Libertarian overtones. Books set in the asteroid belt so often do. It’s a science fiction cliché that Belters are fiercely independent Libertarian supermen who stand up for their rights against an oppressive Earth government. I wonder where that got started. 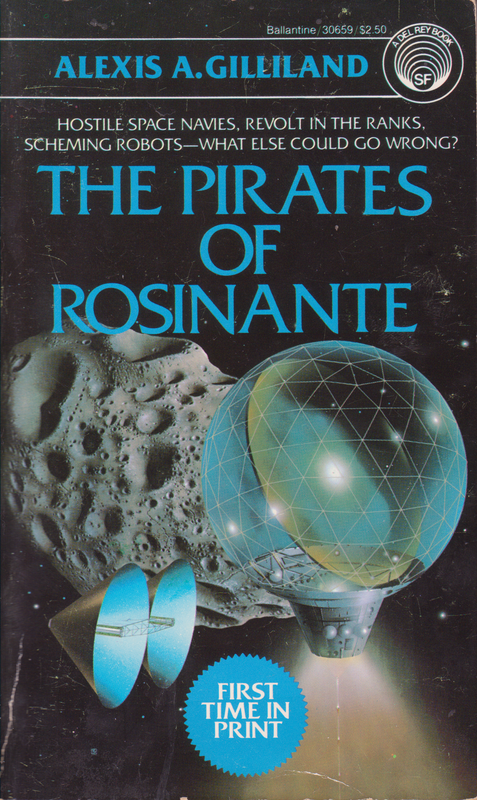 Still, The Pirates of Rosinante was not overtly that kind of book. Sure, Charles Cantrell is the sort of guy who appreciates individual freedom, even allowing his colony’s newspaper to outright libel him because he believes in free speech, but he’s level-headed about it. In fact, where a lesser protagonist might have ended this book’s climactic standoff with a show of force either ending in real violence or his opponents’ backing down, the book took a turn on that. Sure, it certainly looked like that was going on up until the final chapter, but the book caught me off-guard and made our protagonist win through cleverness and negotiation instead. So what happens is that there’s almost a war between Japan and Rosinante. Cantrell orders the construction of a warship, called the UFOS for some reason, and sends it toward Earth. There’s a threat that if things go sour, this warship could take out Tokyo in retaliation. The ship is essentially a geodesic dome with an engine on it, powered by some big sunlight lasers that superheat a compound of uranium and, I think, boron. The details got a bit thick on the ground there. Cantrell shows up and starts to negotiate. It helps that an AI has managed to convert the Japanese residents of Ceres to his side and that was the whole reason this stuff got started. Instead of threatening destruction, Cantrell offers the Japanese government help in building a space elevator. Backstory note: Ships have stopped taking off from Earth because it was found their propulsion method was destroying the ozone layer. So a space elevator would be great. He reveals that a lot of what went into creating this UFOS warship would help with the construction, and he also offers up some funding. Earlier in the book somebody discovered a huge stockpile of gold on one of the Ceres bases. Apparently the NAU base was shipping gold back to Earth, but not all of it, and therefore there was as stockpile that Cantrell’s men discovered. It’s worth a lot of money. But then when Cantrell faces off against the NAU representative, he says that he didn’t actually use that money at all, but instead found a way to refine gold at Rosinante by using the big solar lasers that have dominated so much of this narrative. In fact, the massive injection of gold into the world economy will be disastrous, at least in the short term, because apparently the gold standard is still a thing. Reflecting that this now-economically-weakened Earth won’t pose him any threats for a little while, Cantrell heads back home and also discovers that his computer is the prophet of a religion. The book ends there, but I feel like that was supposed to be heading into a sequel. Maybe not. Okay, so while this book was full of political twisting and turning interspersed with some science that I’m not in the least bit qualified to comment on, I have to say that this book had some great stuff going for it. For one, if political thrillers are your jam, I bet you’d like this book. They’re not really my jam, although I have a healthy respect for them when they’re done right. I don’t read a lot of Tom Clancy books, but I get why people do. On the flip side, though, this book sped right along. It wasn’t a light read, but at times it felt like one. I didn’t have much trouble keeping myself reading, although I did take two naps while reading this book. Sometimes I think a good rating system would be how many times I fell asleep reading a given book. Then I remember how terrible my sleeping habits are and realize it wouldn’t be fair to most books. Still, it’s a thought. The characters were relatively flat and there were times I was scared that the politics would get problematic. There’s a lot of divisiveness between “Anglos,” Hispanics, and the Japanese that I was afraid would turn racially ugly, but it never did. One of the bad guys at the beginning of the book had a problem with “mixing the races” but that was nipped in the bud quite early, stating that it would basically outlaw the entire population of the Rosinante colony. Racism is not a useful tool anywhere, but this book makes it clear that it’s especially not welcome in space. I think I’d enjoy reading the previous two books in this series. I’ll be on the lookout for them. I actually have a copy of this book. Never been able to get interested enough to actually read it.